The innovative concept for a new generation of sporty tyres. Our supreme answer to the demands of dry handling, wet grip, low rolling resistance and above all, a comfortable drive. 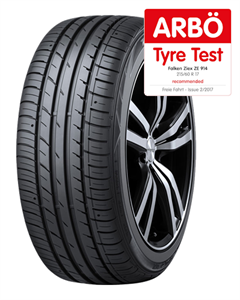 The asymmetrical tread design of the tyre shoulders and the four longitudinal grooves guarantee maximum road grip and improve water uptake and dispersion as well as braking and handling in wet conditions. The stiff tread blocks enhance directional stability and add sportiness to cornering. Small horizontal grooves and sipes optimize handling and driving comfort. With the ZIEX ZE914 ECORUN Falken offers cost-conscious drivers a modern tyre with optimised rolling resistance and well-balanced performance characteristics. Outstanding level of grip on dry and wet roads. Particularly suitable for a sporty driving style. With Special Eyes tyre wear indicators. Used to be a good garage but lately they became more expansive than the main dealers. When I told them they didn’t even looked into it. Better to ask for a quote before if doing anything out of ordinary - otherwise, for the cheap and quick jobs, all good. Had some tyres fitted - excellent job and attention to detail ! will definitely return. Good, quick and efficient replacement got me back on the road after a puncture. Excellent value. Efficient service. Friendly staff. Will use again. Fixed a puncture at a moment's notice which got me out of a binder. Have used before and certainly will again. Always good work.